We are delighted that you are interested in learning more about Open Circle Unitarian Universalist Fellowship and Unitarian Universalism. If you haven't already, we encourage you to explore our website which includes a lot of information about the Unitarian Universalist faith and Open Circle UU Fellowship. However, we'd like to provide some information specifically to make you feel more comfortable and "at home" the first time you come to Open Circle. Come as You Are: Please feel free to come as you are most comfortable. Some people dress up while others are very casual. 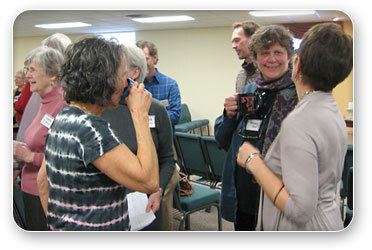 This "come as you are" atmosphere extends beyond clothing as we welcome all seekers. Parking: There is street parking as well as a city parking lot on the corner of Main and Third Streets that is adjacent to our property. Both are free on nights and weekends. There is a small lot on the west side of our building which we try to keep available for those with mobility issues or who may have a lot to carry into the building. The parking lot on the east side of our building does not belong to the Fellowship and should not be used. Accessibility: The building is generally accessible, and assistive listening devices are available. Child Care and Religious Education: We are a multigenerational faith community committed to life-long learning and spiritual development. Children are welcome and encouraged to be part of the Fellowship. Religious Education classes are offered every Sunday for elementary age children. Child care is available during Sunday services every Sunday for preschool children. Children are invited into the sanctuary for the first part of the service, including "a time for all ages" after which they leave and go to child care and RE class. (Children are also welcome to remain in the service if that is the preference.) Children are picked up by their parents following the service and welcomed to the hospitality time following the service. 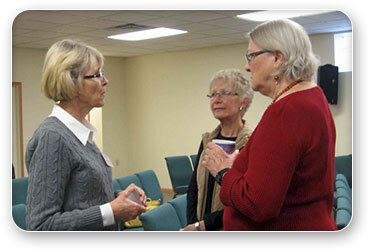 Sunday Worship and Programs: Sunday programming at Open Circle is diverse in both content and format. As a small, primarily lay-led congregation, with a part-time Consulting Minister, we offer what might be called a "traditional worship service" - including music, hymns, readings, sharing of joys and concerns, and a sermon. We enjoy food and fellowship with a coffee hour following our regular Sunday sermons and a potluck meal on any fifth Sundays of the month. 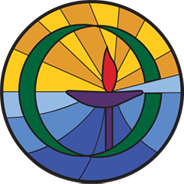 Welcoming Congregation: Open Circle has been designated a "Welcoming Congregation" by the Unitarian Universalist Association in recognition of our commitment to be welcoming to all. While this designation pays special attention to welcoming gay, lesbian, bisexual, and transgender persons to our community, Open Circle welcomes you, whoever you are. We are enriched by a diversity of beliefs, backgrounds and experiences and we look forward to welcoming you!